Company theme is a quite simple but a creative business WCAG and ADA WordPress theme purposed for a plumbers services website. If you are obliged by law to meet WCAG 2.1 and ADA standards to adjust a website for people with disabilities, then you can quickly get website accessibility using this WordPress theme! The company theme brings a set of handy features and user-friendly widgets (for social icons, short info, testimonials, image carousel, team members or contact form). Show website visitors what your company is doing and attractively present your completed projects. 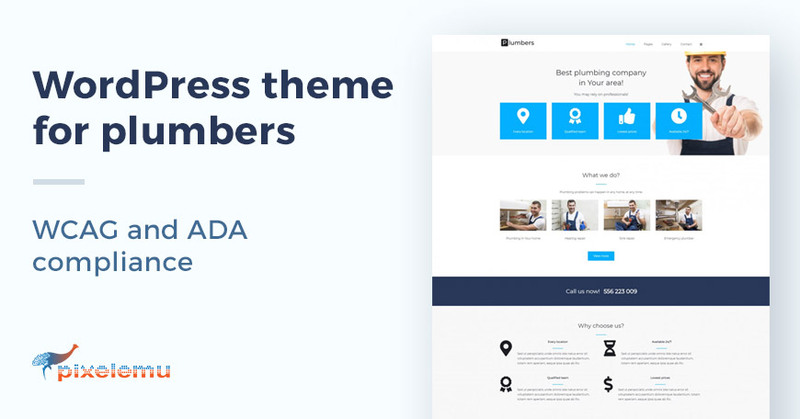 The plumber's company theme demo comes in two versions - the default one and WCAG and ADA compliant one. Both are ready to download. Presented functionalities can be achieved at your website - it’s only about widgets and a proper theme configuration. Build a successful business website!